The Savvy Stamper: It's Time to Hop With the Stamping Boutique! It's Time to Hop With the Stamping Boutique! We are hosting a "Spring Fever" blog hop this month! We're all sick of the snow and would love a little sunshine and flowers to pop in so we decided to bring them on ourselves! And bring it we did! You'll have to make sure you hop to every design team blog. Make sure you post on EACH blog post for TSB to be eligible for the prize, our 4 new spring images. You will need to start at Amanda's blog (www.colouringourworld.blogspot.com) and work your way through the group! At the Stamping Boutique, there will be an Inlinkz where you can post your comment after you have completed hop! From this list, the winner will be chosen randomly! The hop will run from February 19th 12AM EST and you will have until February 20th 6PM EST. After that time, the comments will be tallied and the winner will be randomly picked. The Design Team used a sketch this month for our creations. And here is my take on the sketch! Those daisies are so "Spring-y"! I love how the embossed panel matches the design on your paper! Love the colors in your card, and the daisies are adorable! Love your coloring, great colors used! Such a pretty card! I really like the added flowers, they match the paper perfect! What a sweetie! Great coloring and super fun colors. Love your papers and matching flowers. Puh-leeeease teach me how to color like you!!!! Your bunny looks real. So amazing! just love Ms. Bunny! Great job on the card! OOHH I love your card!! The colours, the image, your colouring!! Very cute!! Oh I love the colors you've used and the embossed panels! I forget how simple and effective embossed panels can be. Super cute card! Great coloring Colleen! This bunny image just makes me smile and think of Spring. Love the DP you used! Beautiful colors! Blessings and Hugs!! Love the embossing peaking out of all the layers, wonderful coloring-so vibrant! How cute is this card? Love all the embellishments/treatments you gave this one - beautiful job. What a cute card. I just love the papers and the embossing. TFS. Love the texture that you did. And the papers are perfect with that image. I love your coloring and the colors you used. Your card shouts Spring! I really like the embossed layer with the patterned paper. Your cute daisy embellies go great with your paper. Great card! I adore the way you colored the bunny! You have the perfect spring card! Colleen, I love the colors you chose. It is very light and definitely springtime. The daisies... very nice. 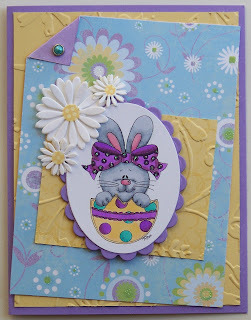 Love the cheery colors and embossing and layers! Great job. love your cute cards thanks for sharing them with us. I just love your colors, and the image is just the cutest!! What a sweetie. Beautiful stamp and nice colours. awwwww....so cute. Perfect Easter colors, too. Love the big bow on the bunny!! The Stamping Boutique Digi Day!